Faridabad which is one of the fastest developing industrial cities in Haryana is now the destination for best schools also. Right from Play schools to senior secondary schools every school has its own unique infrastructure, programs and facilities to educate the children in a best way. Though the fees structure differs in every school, each school has its own importance in educating young minds and nurturing different abilities and talents in growing children. Let us check top ten pre-schools in Faridabad that can be best suited for your kid. Tiny Tots is a nursery school which implies play way method of teaching. It believes “learning is a fun” and thus educates the children through games, puzzles and other fun methods. It provides safe and secured environment for the growing children along with a healthy student: teacher ratio which is around 1: 15. Regular mock tests are conducted to improve the child through play way method. It is located in new industrial Township of Faridabad. This is from the famous chain of pre-school named “Shemrock” which is one of the first pre-school chains in India. Having more than 25 years of experience in education field, Shemrock cares each child and his needs by providing well equipped AC classrooms, student friendly teachers, best play area, doll room, activity centre, Mini zoo, gym along with huge auditorium and celebration corner. It is the first school to choose Choto bheem as the brand ambassador for this pre-school chain. Kidzee little lamps located at sector 19 is again from the famous group of pre-school chain named “Kidzee”. As we all know, Kidzee is a best pre-school chain in the whole Asia by nurturing more than 2, 00, 000 students across the country. 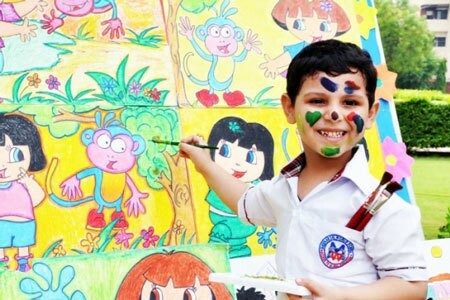 Also, it is the first school to introduce special child development program called “Early Childhood care and Education”. (ECCE).It is also the first school to introduce new method of learning called “ILLUME” which gives each child opportunity to prove himself. This is one of the pre-schools which is located at sector 37 of Faridabad is run by a team of best professionals. This school has extraordinary facilities such as Wi-fi enabled campus, 24 hour CCTV camera protection, AC classrooms and transport facility, ro purified water and so on. This is a school which provides international standard of education along with Indian virtues and culture. This school believes in activity based learning and thus engages children with lot of toys, games and fun. Also it implies age based curriculum which makes students to feel comfortable to learn their age appropriate syllabus. It is located at NIT of Faridabad. Dudes and dolls is a best pre-school which is spread around 12,000 square feet and it is located at sector 48 of Faridabad. It is an excellent school known for its attractive infrastructure which has separate clubs to train students in various fields. Clubs such as drama club, singing club and flight boarding club are some of the famous clubs in this school which makes children to get a real life experience. As we know already, Bachpan is a famous chain of pre-schools having more than 900 branches across India. Bachpan which is located at spring field colony of Faridabad believe in innovative methods of teaching through 3d Smart classrooms and talking books called Speak-o-book. Some of the special facilities in this school are activity room, ball room, splash pool, concept room and sand pit. Sparkles is a best school which implies early childhood program through experienced staffs. It has facilitated activity rooms, art and craft rooms, dancing club, personality development center and so on. It believes in age appropriate curriculum which makes children comfortable to learn happily. Champs is a unit of Champs Educational society and it is located at Green field colony of Faridabad. It has extraordinary facilities such as AC classrooms, transport facility, 100% power backup during school hours, soft skill improvement programs and day boarding. It has also introduced one year diploma course in Pre-school management and education program which guarantees 100% job for candidates seeking employment in this field. This is one of the fastest developing pre-schools in Faridabad which has right now four branches in Faridabad. Pre-school operates between 9.00 A.M to 11.30 A.M, This school supports experimental learning than just “by-hearting”. In other words, it supports concept based learning and Montessori methods of teaching which makes learning to be a fun. Other facilities such as bunk beds, splash pool, educational toys, health and hygienic washrooms are provided by this school. Hi, I think you can also include Risekids preschool now. It is the parental of S.Chand Group company which is the largest Indian publication house. I guess Dudes and Dolls should be on the top as it is one of a kind preschool in Faridabad. I have never seen any other preschool working so hard as Dudes and Dolls.